The polite way of saying it, “I’m particularly vexed at the University’s cumbersome, intrusive, onerous, and user-hostile network access policies and devices.” If I seem to be offline for the next week (while painters spruce up my office), please understand that I probably am offline. In honour of the shock and horror that Scotland has experienced with its current blizzard (we have 13 of snow on the ground outside our flat) (that was 13 centimeters, not 13 inches), I dug up a transcript of the Father Guido Sarducci’s monologue from Saturday Night Live wherein he touches on the extremely cold weather in Italy and on his theory of flying saucers. I can’t reproduce his accent (I still hear his voice saying, “Renn Bo is-a her nemm”), but at least the words are pretty much here. The weather has really been something. It’s been cold all over. When I left Rome yesterday, it was two. The fountains were frozen and everything. And that’s Celsius. It’s all the way down to Celsius. In Naples it was only up to ten, and down in Reggio Calabria, home of the Marconi School of Broadcasting, my alma mater, it was twelve. It was a little warmer in Palermo, sixteen in the Conca d’Oro. Up north in Venice, a cold minus two. In the sister city of Trieste, two, too. Over in Milano, it was one degree. Bologna was three. Skies clear in Bologna tonight. A good night for spotting U.F.O.’s — “oofoes” we call them in Italy. I once saw a UFO near Bologna. I was driving from Assisi on this road here, and it was late at night, and from nowhere there were these two giant white lights and it just zoomed right past me real fast and it just seemed to disappear. It was about ten feet long I would say — real sleek looking — looked a lot like a Corvette. And as soon as it was gone I said to myself, did I see that or not? And you see, that’s what they do to you. They shoot you with something, some kind of ray gun — and it makes you doubt that you saw them. If you think you’ve never seen one, you probably see them all the time. And after what happened to me, I started carrying my camera with me at all times, just to prove to myself that I’m not hallucinating. Was just a few months ago that I spotted one again. I was in Los Angeles at the home of a friend of mine, Rainbow is her name. Fortunately, I had my camera with me. You can’t tell much from the photo, but it was kind of silvery looking. And it was in the air a long time, just kind of hovering there. 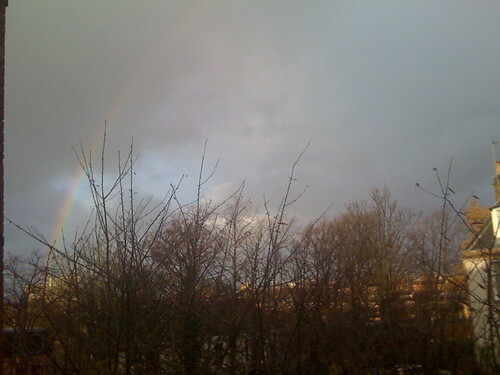 And Rainbow says “Listen: all the dogs are barking.” And it was true — all the dogs were barking. And then it just kind of very slowly drifted away. I had this blow-up made of the UFO. I know what you’re thinking: you think it’s just the Goodyear blimp. That’s what everybody says. But I did some research and called the Goodyear Blimp people and they told me their nearest blimp was miles away from where I spotted this UFO. And that’s when it dawned on me. Don’t you think that if these aliens are smart enough to get here, they’re smart enough to disguise their spaceships as Goodyear Blimps? Come on — they weren’t born yesterday. They’ve been spying on us like this for years and years. And my research proves that about one out of every five sightings of Goodyear Blimps is actually a flying saucer in disguise. So, don’t take any chances. If you ever see what you think is the Goodyear Blimp, call the police, call the mayor of your town, call the president, even call your senators – you can never tell. David Jones, “Use and Sign,” in The Dying Gaul and Other Writings , London: Faber & Faber, 1978, p. 183. Margaret and I are on tenterhooks this morning! In part, that’s due to Margaret giving a lecture to Doug Gay’s “Political Theology” course; she’s talking to them about “The Church as Polis” in the work of John Howard Yoder, Stan Hauerwas, and Bill Cavanaugh. Since this is a two-hour presentation of the topic that she used to teach as a full-semester course at Loyola, she has no lack of material to discuss with the class. She’s also put together a Prezi presentation that rocks. I’m a Keynote user by disposition, but I steered Margaret to Prezi in the interest of making sure that the presentation could be edited at home on her MacBook and at work on her Dell, would be saved to the cloud so as not to be at risk of unavailability or corruption, and would run directly on the Dell in the classroom in which she’s lecturing. Though it took some banging away for her to get used to the interface and editing tools, the presentation itself is excellent (Prezi could use some refinements on the editing side; Margaret had a few painful frustrations). The class is meeting now as I type; I’m eager to hear at the break how things are going. Then tonight, we’re heading down to the city centre to hear a lecture by Nicholas Lash, a theological hero of mine whom I’ve never met or heard before. I’ll probably bring along the copy of Theology on the Way to Emmaus for him to autograph, the copy that I bought back when I was in Hauerwas’s theology seminar and Lash’s books were not readily available in the US. I’ve read and reread his essays since those days, and I always find them a source of inspiration and provocation. I will, however, not wave a lighter in the air and yell for him to read one of my favourite essays as an encore. First, two and half years ago my dad died; he would have been seventy-five today. Prayers were offered for him at the cathedral. May his soul, and the souls of all the faithful, by the mercies of God rest in peace. Second, this is the weekend of the Society of Biblical Literature conference back in the USA. It’s the first one I’ve missed since (I think) 1985. A few days ago, Jim Davila noted that I was the first biblical-studies scholar to begin a weblog (there having been, of course, many active in listserves, bulletin boards, usenet groups, and so on before weblogs took shape); so far as we know, I was the only one who blogged about SBL 2002 (here, and here). Thanks for the hat tip, Jim, even though I am but a liminal member of the guild of “bibliobloggers” (since I write about whatever I care to, rather than principally about the Bible). Time for bed — see you later. Don’t stay up too late, SBL-goers. Bless you, Dad. The church inventory identifies it as The Flight Into Egypt, presumably because it shows a couple carrying a baby, though the man’s breadbasket seems incongruous, there’s no beast supporting Mary (not decisive, though it’s a common element), no sign of Egypt or even “flight.” Moreover, the other panels in the group show (upper left) the centurion imploring Jesus’ aid; (upper right) Jesus in a garden (perhaps answering the centurion’s prayer? 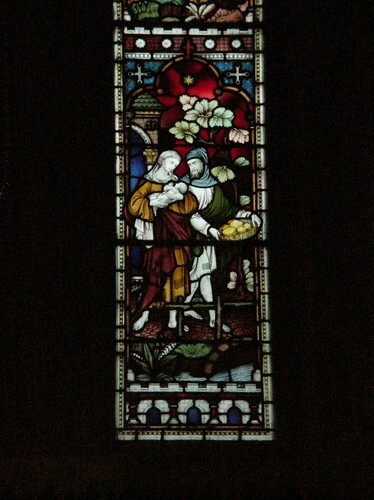 ); (lower left) the angel calling Cornelius to prpare a place for Peter (saying, “Thy prayers and thine alms are come up”, Acts 10:4); and this one. No prize for solving the mystery, but all credit and glory will be unto you. Kelvin’s blog reminds me that, come Saturday, I’ll be welcoming to St Mary’s any and all who would like to come look around the church, perhaps ask questions, and take as many photos as time and lighting permit. I expect that, rather than talking about the sacraments, I’ll concentrate on church architecture and the semiotics of ecclesiastical space; the main point, though, is to encourage people to come look around whether they believe anything or not, take some photos (which we hope they might share on Flickr or other public sites), thus documenting our church in greater fullness and calling attention to the wonderfulness of the cathedral. If anyone comes to church Sunday morning who might otherwise not have, that’s a bonus. You may note that this definition is so slanted toward particular fields of endeavour that it might as well be called “Bonus points for STEM + Policy-Oriented Fields, Kick in the Teeth for Arts.” So be it. Anyway, I’m racking my brain trying to think of something I’ve done since 2008 that might fit that definition. With a looser time frame, I could point to the Lessig Read-a-Thon and the genesis of LibriVox (I’m not taking credit for the work that Hugh did on LibriVox, far from it!, but this is the closest I can come to the kind of “impact” for which I’m being asked). Remembering that the people who will be evaluating me have no sentimental attachment to me such as might be swayed by avowals of how important I’ve been as a teacher or intellectual influence, can anybody think of an “impact” I’ve had on “the economy, society, public policy or services, culture, the environment or quality of life” in 2008 or later? I’m flat stumped, myself. Despite both parents’ rich immersion in the world of poetry, I have long had only a halting appreciation for poetic expression. Some poems grab me right away and hold me; others may be artful, or clever, or subtle, or deeply-felt, or whatever — but I just never catch them. I don’t like not being a good general-poetry appreciator; it makes me too grumpy about good people’s good work. I’ve never developed, though, the capacity to admire good-but-not-outstanding poetry. That’s by way of preface, though, to saying that I happened across the three sonnets Roz Kaveney wrote for her friend Neil Gaiman . I’m impressed with them all, but the first of the three — which touches on new friendship in general, not Neil himself in particular — touches me especially, especially as Margaret and I share the delight of new friendships in Scotland (and the echoes and resonances that they make with long, deep, old friendships). just like the one when something’s gone away. it’s better gone, keep sucking at the gum. is bubbles like champagne that jump your heart. So, cheers to Neil Gaiman on his recent fiftieth birthday, and a sweeping tip of my hat to Roz Kaveny, and a wink and a smile to my cherished friends, who jump my heart. 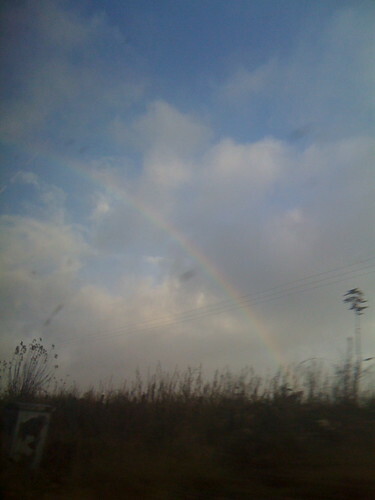 Starting on the train on Friday, Margaret and I saw four rainbows (or portions thereof) within twenty-four hours. 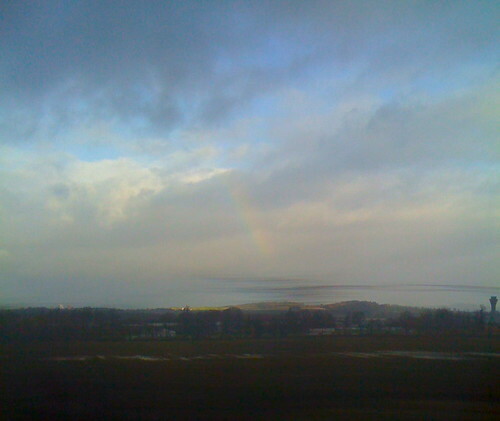 On the train, east of Linlithgow. 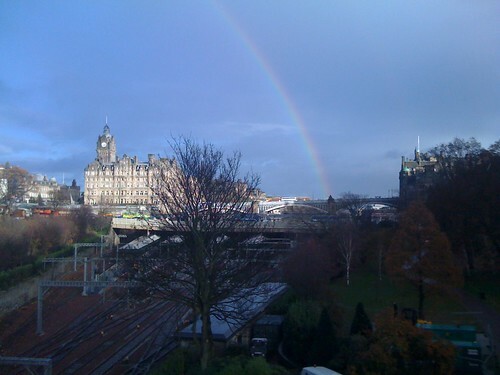 A little closer to Edinburgh. From in front of the National Gallery, about 3:00 that afternoon. From our west window on Partickhill, Saturday morning. On the train back from Edinburgh yesterday afternoon, Margaret was pressing me to publish my “Magritte and Krazy Kat” presentation and the “Sensing Hermeneutics” presentation. I demurred, arguing that they depend heavily on graphics and audio that would be hard to reproduce (affordably) in print, and that I don’t have the fastidiousness and stubbornness to fight for permission to reproduce all the images from rights-holders clearly enough to satisfy most publishers. Margaret riposted that I should then put the presentations online, with the full rhetorical force of foisting my own ideas on me. It seems like a great idea, so I took her up on her offer to edit the presentation I gave yesterday, and I’ll hand over the “Sensing Hermeneutics” ms after “Magritte and Krazy Kat” is ready. Then I’ll whip up PDFs, and Kindle and iPad editions. As always, Thanks, Margaret!